For his show Wind in Athens/Möhren in Athen Erik Steinbrecher left Berlin for Athens, his suitcase packed with carrots. The artist's art odyssee began. His chosen site for an intervention was the National Archaeological Museum. It is considered one of the great museums of the world and contains the richest collection of most important artifacts from Greek antiquity worldwide. During his visit in the collection Steinbrecher installed single carrots in the exposition spaces; close to sculptures and artfacts, on bases and behind walls. This sculptural and performative intervention has been photographed by the artist himself. For this publication Steinbrecher overworked these documents making up the images with cancarrots. 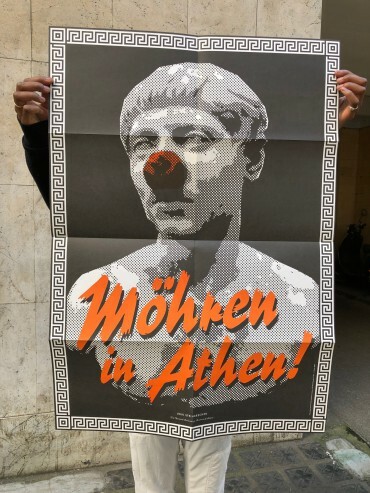 While contributing at ReMap 2/Athens Biennale, a poster-artwork by Christoph Keller informed about Steinbrecher's "exhibtion" in the museum throughout Athens.